Official records indicate that the city of Bowling Green saw the need for fire protection around the year 1820. However, their first fire engine wasn’t purchased until 1831 at a cost of $300 from the American Hydraulic Company. It was a hand-pulled, hand-operated rotary engine. Until 1831, it is not known what kind of fire protection, if any, Bowling Green had. By September of 1832, an engine house had been constructed. By 1838, Bowling Green was in the market for another fire engine, though records don’t indicate if it was to replace or supplement the 1831 engine. The engine purchased in 1838 cost $700. Most records from this point until the 1860’s are either missing or incomplete. 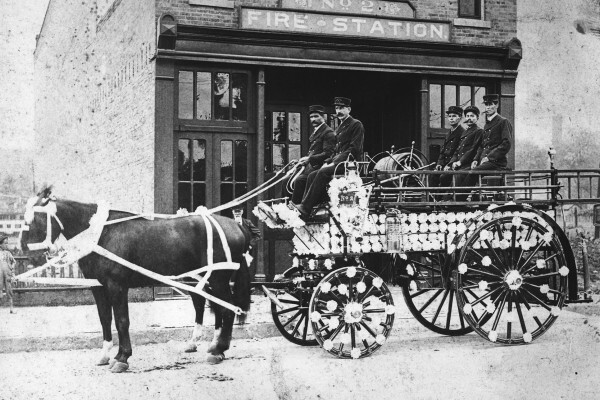 In February of 1866, another fire engine was purchased for $700 and it is assumed that this was another hand-pulled, hand-operated machine since a good steam fire engine cost $2,000 or more at that time. Records indicate that the volunteers were paid $2 for each fire they attended. In those days, they averaged about 60 fires per year. During the 1870’s, 80’s and 90’s, various purchases were made to add to and repair the fire apparatus for the volunteers. 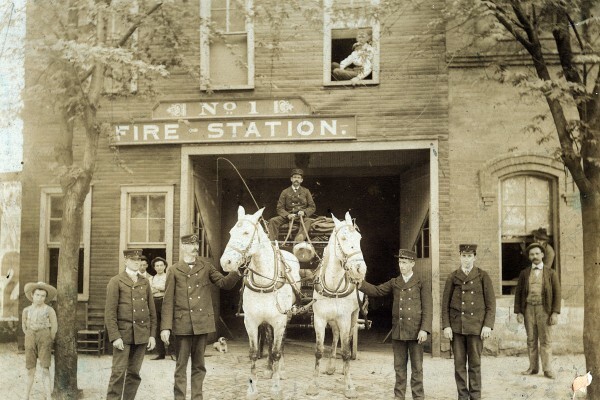 On September 1, 1898, Bowling Green’s first paid fire department came into existence. John Moltenberry and Dave W. Harrison were appointed firemen, since both had seen action as volunteers. The chief of the department was James A. Wilkerson, who also served as the city engineer at the same time and had been chief of the volunteer department. As the department became a paid one, it also moved its headquarters to a new location on State Street. In addition, the firefighters could ride on a hose and chemical wagon pulled by a team of horses rather than having to pull their equipment to a fire by hand. Hose and chemical wagons were purchased in 1898 and 1900, while a hook and ladder was purchased in 1901. 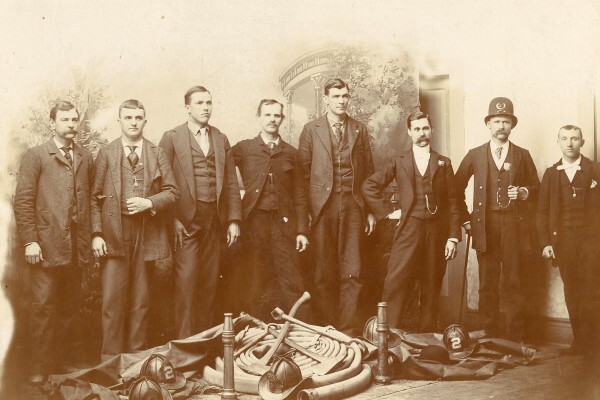 Until the early 1900’s when the paid department was enlarged, the volunteers aided the paid firefighters by running to the fire station and pulling their hose reels to the fire scene in order to assist. Around this same time, 17 fire alarm boxes were placed in the business section of Bowling Green and were abandoned for use when telephones became available. In April of 1904, John Moltenberry was appointed to the position of chief after having spent 2 years as a firefighter and 3 years as a captain. Moltenberry served as chief until the end of 1938. His tenure as the city’s first full-time paid fire chief saw many changes and improvements in the department. 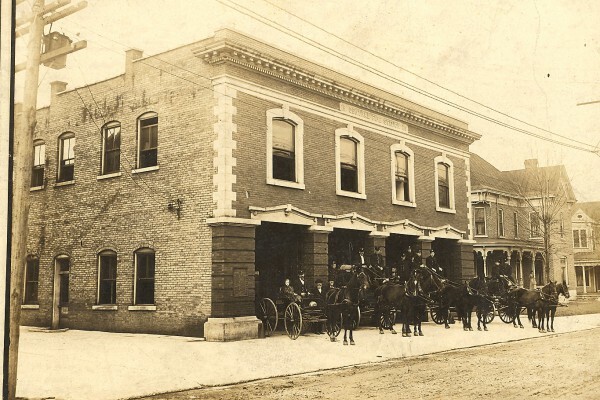 A new central fire station was completed in 1909 at a cost of about $10,000. 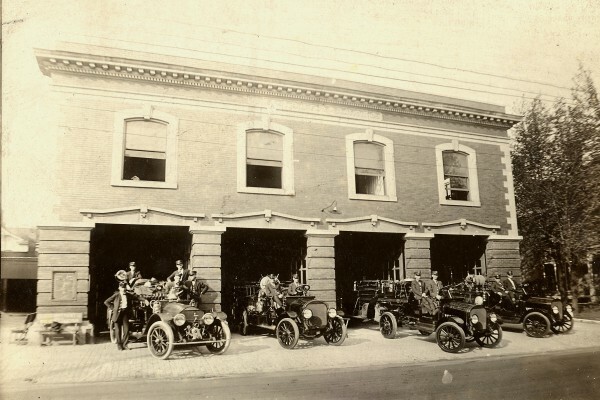 In January of 1912, the chief’s pay was $85 per month, captains received $65 and firefighters with more than two years of experience received $60. Lesser experienced firefighters received less pay. The department at that time consisted of ten men that worked six days and six nights and had one day off. During the 1930’s, firefighters began working a 24 hours on/24 hours off work schedule. In 1955, the number of fire stations increased from one to three; in 1970, a fourth station was opened to meet the needs of the growing city. In 1964, the firefighters also changed to a 24 hours on/48 hours off schedule, which they still work today. In 1980, a new headquarters station was built on 7th Street and replaced the old building that still had a hay loft for the horses. In 1999, a new substation was opened on the north side of Bowling Green. Two older substations were replaced with new buildings in 2001. In 2009, an additional fire substation was built, this one in the Greenwood area and a new administrative building was built beside the headquarters station near downtown. This brings us to a current total of 6 stations and 1 administrative building. Several pieces of equipment have been purchased over the years, each one replacing an older vehicle or adding to the fleet. We currently have 9 front line apparatus, with several support vehicles including 3 air crash/fire/rescue trucks, a hazardous materials vehicle, an equipment truck and a brush truck, along with special operations trailers to supplement the fleet. The bid process for purchasing new equipment is very competitive and members of the fire department serve as advisors in developing the specifications so that all of the department’s equipment needs are met. These days, we have 125 personnel working at the department in administration, suppression, prevention and training. Besides providing fire suppression, rescue and first responder services to the city, we also educate thousands of people each year about fire safety, inspect the businesses in our city for fire code violations and investigate fire scenes to determine the origin and cause of the fire. A beginning firefighter’s current annual starting pay is $38,663, while the chief of the department makes upwards of $100,000 annually.